Ezekiel 38:1-6 foretells of a time when a great demonic leader from Russia will lead a coalition of nations such as Turkey, Iran, Lybia and the Sudan against Israel. Identified as "Gog," he will gather a great horde of invading armies together. What then will that horde be planning on doing? Ezekiel 38:7-17 gives us the chilling answer. "7'Get ready; be prepared, you and all the hordes gathered about you, and take command of them. 8After many days you will be called to arms. In future years you will invade a land that has recovered from war, whose people were gathered from many nations to the mountains of Israel, which had long been desolate. They had been brought out from the nations, and now all of them live in safety. 9You and all your troops and the many nations with you will go up, advancing like a storm; you will be like a cloud covering the land." 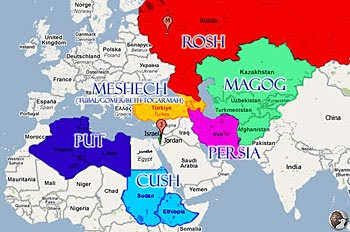 Looking at the map below, isn't it interesting that the Gog-Magog alliance that Ezekiel describes is missing all the border countries around Israel — Egypt, Jordan, Syria, Lebanon and Gaza? It's no secret that these countries hate Israel with a passion. They've got thousands of missiles pointed at Israel right now, their fingers itching in anticipation to push the firing buttons. So, the war Israel is recovering from could be a war in which Israel has to subjugate the neighboring countries around them, such as Psalm 83 describes. Otherwise, these bordering nations would have to be members of the Gog-Magog alliance, but the text clearly leaves them out. Israel as a nation exists today, just as verse 8 foretold, for the "people were gathered from many nations to the mountains of Israel, which had long been desolate." For over 100 years now the Jews have been brought out of the nations, back to their native land. The world in 1948 witnessed those regathered Jews form a nation where one hadn't existed in almost 1,900 years. Many Jews still are spread throughout the world, but they in great numbers continue to return to Israel. Verse 8 also tells us that the Jews will be brought out from the nations to live in safety. Now "safety" is an interesting word because it could mean a number of things. "Safety" could mean that they live confidently in the land, secure in their military might. It could also mean they are engrained in the land as a nation once more, safe among their own people. Or, it could mean that there are finally no outside threats against Israel. The storm in verse 9 — those hordes of Gog — when they come will be so massive in numbers that they'll appear to be as a cloud covering the land. I come from areas where there are hills and mountains, and when I moved to Texas I never saw so much sky. When a Texas storm approaches you can see this black cloud filling the entire sky with a little gray line underneath along the horizon. It's approach can be intimidating at times. This is what it will feel like for Israel as this invading storm approaches. "10'This is what the Sovereign LORD says: On that day thoughts will come into your mind and you will devise an evil scheme. 11You will say, 'I will invade a land of unwalled villages; I will attack a peaceful and unsuspecting people — all of them living without walls and without gates and bars. 12I will plunder and loot and turn my hand against the resettled ruins and the people gathered from the nations, rich in livestock and goods, living at the center of the land.' 13Sheba and Dedan and the merchants of Tarshish and all her villages will say to you, 'Have you come to plunder? Have you gathered your hordes to loot, to carry off silver and gold, to take away livestock and goods and to seize much plunder?'" Notice Israel's condition — they are living in safety and they have no walls. In Ezekiel's time, cities had protective walls surrounding their buildings to keep invading armies at bay. It could be that as Ezekiel is given a glimpse into the future he's dismayed that the modern cities of Israel such as Tel Aviv, Haifa and even the sprawling Jerusalem have no protective walls. Israel does have a long running wall to keep the Palestinian terrorists at bay. Whether it's the total absence of any protective walls, or just the absence of walls around cities that is the prerequisite for Gog's conclusion that Israel is defenseless is open to debate. What is Gog's motive for this battle? Simple, he wants money. Israel has become very rich. In its short existence Israel quickly became a first world nation. They have been rated the fourth largest army on the entire planet. They revitalized an abused and barren land, making it fertile once more. They have the wealth of the Dead Sea minerals and recently they have discovered a huge off-shore bounty of natural gas and oil. 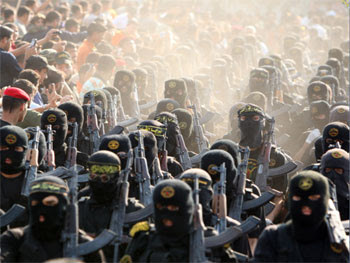 This is all very enticing to the countries in the Middle East, and Gog especially wants to come and plunder them. Verse 13 cites some interesting nations. Listed there are Sheba and Dedan, which are the old names for Saudi Arabia and the United Arab Emirates. Ezekiel is telling us that those players are just going to sit out Gog's invasion. We also know who the merchants of Tarshish are as Tarshish was considered anything past the Rock of Gibraltar in Spain. Spain was considered in Ezekiel's time as far as the known world reached. Actual archeological evidence exists that shows that the ancient Middle East actually traded with Great Britain. Some Bible versions might have the interpretation of "her villages" as "young lions." Should this be the lion of Great Britain, then the young lions would be any British former colony such as America, Australia and Canada. They as well will sit out Gog's invasion, merely content to mildly protest and watch what the outcome will be. "14Therefore, son of man, prophesy and say to Gog: 'This is what the Sovereign LORD says: In that day, when my people Israel are living in safety, will you not take notice of it? 15You will come from your place in the far north, you and many nations with you, all of them riding on horses, a great horde, a mighty army. 16You will advance against my people Israel like a cloud that covers the land. In days to come, O Gog, I will bring you against my land, so that the nations may know me when I show myself holy through you before their eyes.'" Looking at the map above, what is the farthest northern city from Jerusalem? It is Moscow. Moscow is identified on the map by an "M" in the red pinpoint. Some people think that the Lord is saying the "far north" is Turkey, but to really get to the farthest north Moscow can be the only logical city as it is the northern most city directly above Jerusalem. This fact also substantiates that Rosh and therefore Gog are definitely from Russia. They both come from the far north. "17'This is what the Sovereign LORD says: Are you not the one I spoke of in former days by my servants the prophets of Israel? At that time they prophesied for years that I would bring you against them.'" In verse 17, it appears that God in His righteous anger pushes past Ezekiel and just jumps right in to address Gog himself. Have you ever seen one of those yo-mama or in-your-face competitions? Just like that, God gets all in Gog's face, stands chest to chest and eye to eye, and threatens with what He already told the prophets of old. When did God denounce Gog before Ezekiel, though? Where in the Old Testament are the other times that the prophets talked about Gog? Well, we have to look at this from God's perspective and Gog's present time. God skips over time here, because time is pretty irrelevant to God, and talks to Gog face to face in the time he will dwell in. God is reading Gog the riot act saying, "Read Ezekiel, read Joel, they were talking about this coming battle, and look Gog you are in so much trouble, and this is what I am going to do to you!" What is God going to do to Gog and his invading armies? In the next part of this "Impending Invasion of Israel" series we'll look at the rest of Ezekiel 38 which tells not only the reader but Gog himself exactly what God is going to do to the invading forces. Telling my parents and friends that the prophecy had come true with the earthquake in the sea, thinking that under the sea was 'divers' places - where divers go! Just because we don't comment all the time, doesn't mean we are not reading... I follow this every day and watch for the comments as well. I really appreciate all the views expressed as you make me think. Do you ever wonder how quick is quick? I know God is patient and we don't want any to miss the rapture, but sometimes I just think I am so ready...so tired of seeing the crime, disasters, the pain, the disrespect for the things of the Lord. Even so, come Lord Jesus! IF YOU LOOK AT THE MAP I STILL LIKE THE MISSING player like Syria.... I think we should be reading and thinking about P83/I17 first! On Syria and Lebanon: On April 5, 2010, during an interview by Wall Street Journal, on how Jordan's relationship with Syria, His Majesty King Abdullah II expressed that "Jordan's relationship with Syria is better than it has been in a long time; probably the best it's ever been. ... So the engagement now between the Syrian and Jordanian government on economic cooperation are at an all-time high. The Israeli-Syrian issue is obviously high on their priority list." But only at the expense of Israel. Notice the implied threat from Jordan's King Abdullah II: If settlements are not dismantled, Israel will face increased difficulty in guaranteeing its own security. And: "Jordan's relationship with Syria is better than it has been in a long time; probably the best it's ever been. ..."